Say what?! Sation makes glitter now? Must...buy...glitter! Glitter's always been a guilty pleasure of mine. I always fell for the stickers in grade school that were either coated in glitter, or scented, and since the majority of scented polishes smell like rotten Jolly Ranchers, I've focused my guilty pleasures on glitter. 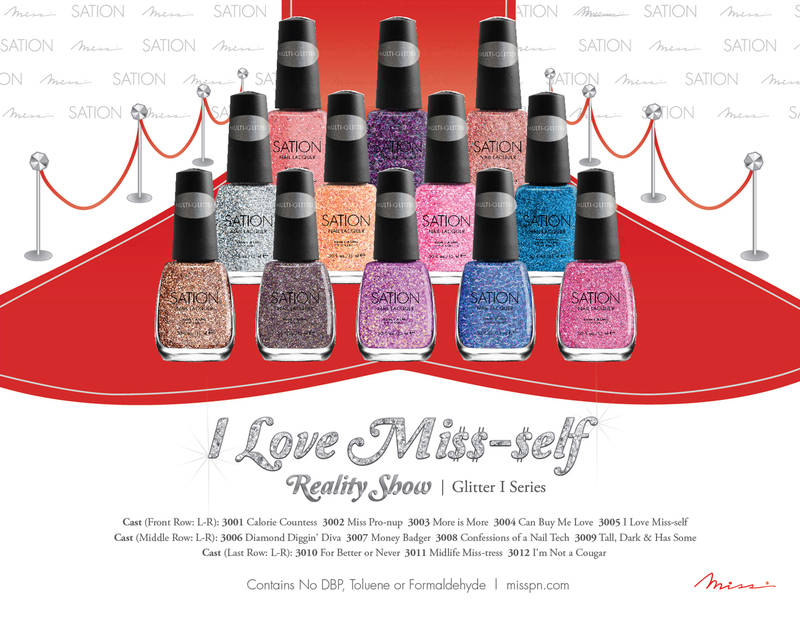 How appropriate that Sation's newest line, their Glitter I series, is called the "I Love Miss-self" Reality Show. Everyone everywhere has enjoyed at least one episode of a reality series, but also secretly prayed that no one would stumble upon the showing while it was in progress. It's like masturbation...everyone does it, but you never want anyone to know you are. 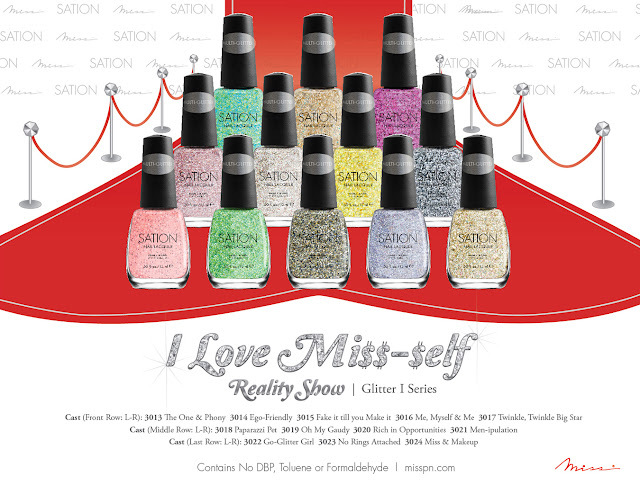 Miss Professional Nail (Miss) announces the launch of its Glitter I Series, the "I Love Miss-self" Reality Show, a sassy tongue-in-cheek spin on the sensation that has swept the nation off its stilettos. Sation's glittery gala puts the fun in dysfunctional by saying buh-bye to Brady Bunch banter, and hello to hi-def hair-pulling and backstage drama. Miss' Creative Director Staci Dao found inspiration for this collection by merging the glitz and glamour of showbiz with the opulent, jewel-toned gems of the season. From fame-chasers to trophy wives, this humorous race to the Hollywood finish line is a fun, flashy ride into our pop-goes-the-beauty universe. "I Love Miss-self" joins the Fall lineup with a sparkling set of stars, including: Calorie Countess, Miss Pro-nup; Tall Dark & Has Some; Paparazzi Pet; No Rings Attached and Oh My Gaudy. The 24-color collection features a cast of multi-glitter and foil finishes; holographic, flakey, bar, kaleidoscope and more. These glitters are ideal for layering over neutrals and staple colors, or simply to play up your signature style. Tune in to 'I Love Miss-self' on www.misspn.com, and don't miss its September debut at your local beauty supply. 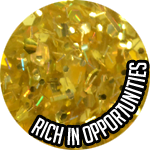 * Multi-glitters will be sold at a premium price point. 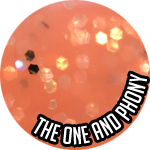 The One & Phony - A very sheer pink-based polish with sparse holographic and black hexagon glitter pieces. It was not fun trying to capture the pieces of glitter on my nails, and it's definitely a glitter that requires the dabbing method. Anything else and you're going to go nuts. The sheer pink was much too sheer for me. It would be fine if the formula wasn't thick, but because it is so thick, three coats to get 1) a nice opaqueness and 2) good glitter coverage is going to be way too thick on the nail. You need to layer this over another polish, plain and simple. Rich in Opportunities - I liked the consistency of this polish the most. I applied three layers in the swatches below and loved every one. And the odd mix of gold sparkle glitter and lime green matte glitter is really fascinating to me. Those colors are not going to work well with a lot of people but I simply love it. I do wish that I had chosen a different base coat for my swatches to show off the colors more, but that will have to be another night's showing. 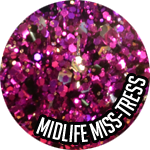 Midlife Miss-Tress - While this is thicker in consistency that Rich in Opportunities, the base polish isn't causing that problem as it is in The One & Phony. 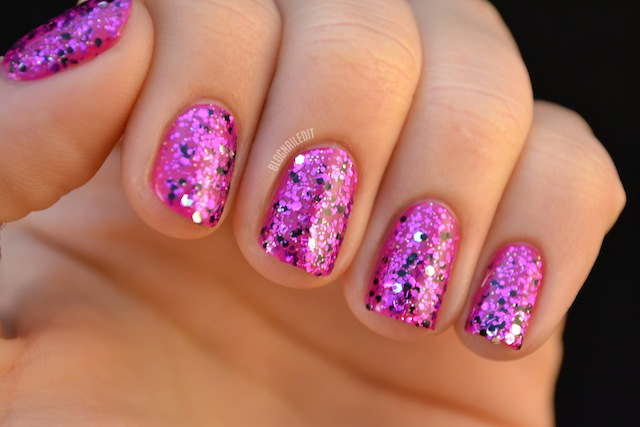 This thickness can be attributed to the unbelievable amount of glitter in the bottle. I mean my god! It's great! This is a glamour-puss polish at its best. It runs the risk of being unusable eventually though, simply because the glitter to base ratio may be too much. I can't even tell you how many bottles of glitter-based polishes I own that have somehow eaten the base polish, leaving a cave of glitter for the brush to live in. It's really strange, but that could very well be an environment problem. So, with these thoughts in mind, let's watch these glitter-bombs in action! The One and Phony over Lion Around (Essie). Obviously, there are more colors you can choose from in the collection, and I'm really interested to see other swatches out there from this collection. With 24 colors to choose from, everyone's sure to find something they love! You can get your colors online now, at the Miss Professional Nail online store. oh my...haha these are awesome! I love your diamond mani! The diamond mani is awesome! I've bought a bunch of these and can't wait to try them on. I seriously need to bring the number of polishes in my stash of untrieds down!! Omg, My glitters from OPI just dried up for like no reason (or ate the base polish...)! Loooove glitter polishes and hate it when they're not glittery enough so good to hear you think there's possibly too much glitter! Nope - not only never seen that reality show - never even heard of it until you wrote it here. I like Station polishes - not a huge glitter fan as I have been over saturated in the past 2 yrs - esp this last yr with so many indies coming into the market. I love, love how you created the diamond - wow! That's just gorg! Wow, love these swatches, and I love your diamond mani! !